Blowout Sale! 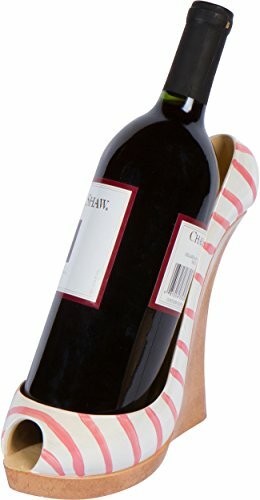 Save 71% on the 7.8'' x 7''H Wedge High Heel Wine Bottle Holder - Stylish Conversation Starter Wine Rack By Hilarious Home (Pink Stripe) by Hilarious Home at Verve Wine Bar. MPN: WDGE-PINK-STRP. Hurry! Limited time offer. Offer valid only while supplies last. Very stylish high heel wine bottle holder. This item perfectly holds a standard size wine bottle. Item makes a great gift and conversation starter. Very stylish high heel wine bottle holder. This item perfectly holds a standard size wine bottle. Item makes a great gift and conversation starter. The holder measures 7.8"L x 3.5"W x 7"H. Get one for your next dinner party or ladies' night in! By Hilarious Home. Makes a great gift or countertop item! If you have any questions about this product by Hilarious Home, contact us by completing and submitting the form below. If you are looking for a specif part number, please include it with your message.